Alarm clock rings, eyes open. Morning routines begin whether it's a hectic weekday or a leisurely weekend. Where does breakfast fit? Morning nutrition is an essential start to the day, but people need breakfast options that are nutrient-dense, convenient and flex to busy lifestyles. 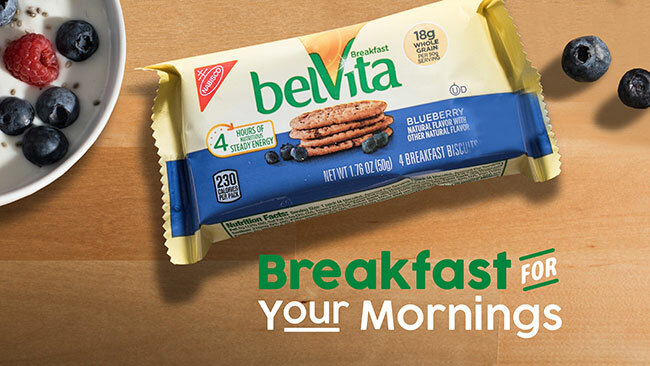 belVita offers delicious, nutritious and convenient choices to fit your morning. Whether your goal is steady morning energy or a protein-rich snack, there's a belVita option for you. Today's Dietitian Spring Symposium is right around the corner and belVita will be there to help fuel your busy conference mornings. Set your alarm for breakfast on Tuesday, May 22 at 7:45 AM! belVita is hosting a breakfast biscuit buffet where you will create a delightful belVita breakfast pairing or parfait while listening to Holley Grainger, MS, RD, who will provide tips on how RDNs can inspire morning solutions for modern lifestyles. You'll be able to share your #MyMorningMoment, too! Tell us what you think about morning nutrition in this QUICK survey* and you'll be entered to win a belVita morning survival kit! *Please share your thoughts by completing a short survey—one before the Today's Dietitian Symposium and one following. Each of the short surveys will take no more than 3-5 minutes to complete. If you complete both surveys, you will be eligible to win a belVita morning survival kit. @belVita Share #MyMorningMoment with #belVita to inspire your followers to find realistic, nutritious morning solutions.